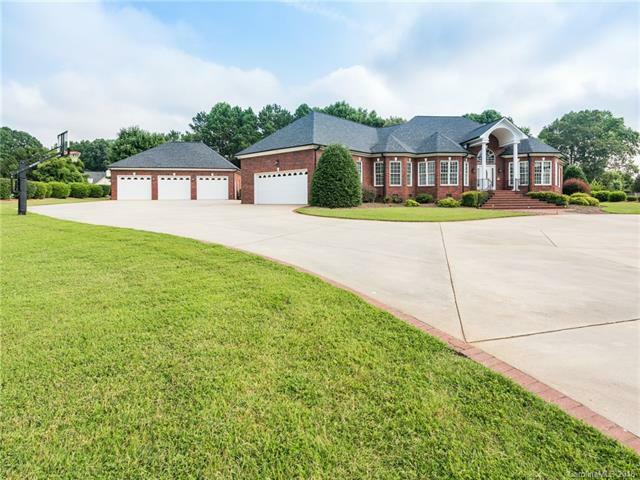 1852 Kendrick Road, Gastonia, NC 28056 (#3413810) :: Robert Greene Real Estate, Inc. CHECK OUT THIS beautiful custom-built home in a great area! It features an open floor plan, hardwood floors, granite counters, walnut inlays in dining room, compass inlays in foyer, arched doorway, columns, built-ins, dimmer switches, wired for surround sound, & much more! Gourmet kitchen equipped w/ wall oven, kitchen island, pull-out drawers for maximum storage & open view. Bar area + wine glass rack. HD projector & 7' wide drop-down projector screen in family room. Spacious Master suite w/ gas fireplace, his & her walk-in closet, whirlpool tub, his/her sinks, & large walk-in shower. Extensive landscaping, 15 zone irrigation system w/ updated controller & invisible fencing. All rooms prewired for phone, cable, CAT5 + commercial grade phone system. Detached garage w/ central heat / air, 200 amp service, 1/2 bath, & new epoxy floor coating. Screened-in patio and built-in grill...a great place to entertain guests. Office and sitting room. Near Gaston Country Club and shopping options.